I know a LOT of teachers (my mom teaches 2nd grade). I know teachers receive lots of gifts at the end of the year. that doesn't include candles, lotion, or candy. so if that's your only option go for it). but I think they'd make GREAT teacher gifts too. write everything down like I should. got the idea let me know and I'll leave proper credit. Anyway, enough gabbing, on with the tutorial. The frame will be the most expensive part of this project. in the scratch and dent section for $6.20. These frames usually cost $20 but often are 50% off. but make sure to leave the part in that makes it a shadow box. large enough from your computer to be your template. 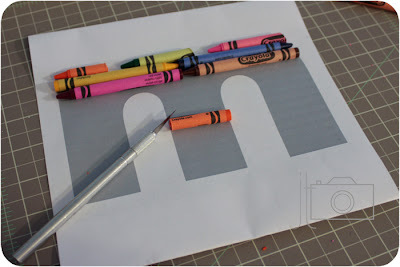 the outline onto the card stock Then just line up the crayons on the computer paper and cut them to size. I have found that it works really well to sort of roll the knife along the crayon. It makes a much more clean cut that way. 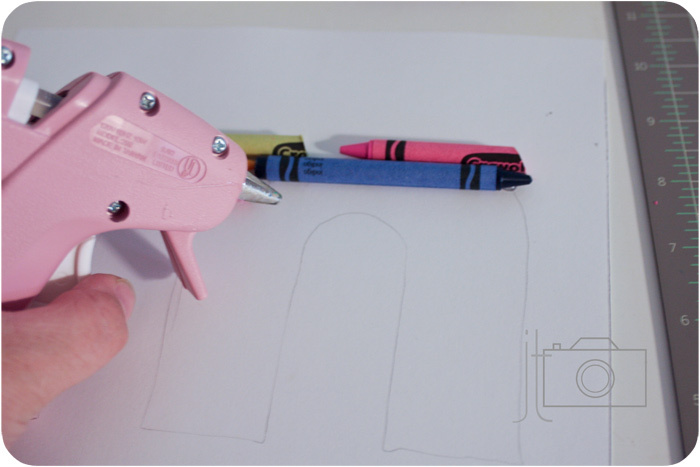 Rather than sawing through the crayon. just how you want them to be! 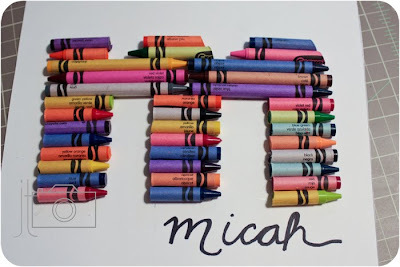 so you can still see it to know where the crayons go. once the crayons are on the paper. Then put a line of hot glue down where you want your crayon. be careful because the crayons melt pretty easily!! Once you have them all glued down you can write the persons name. This is AWESOME! I love color, and this is LITERALLY color. My four-year-old nephew Jack definitely has one of these in his future. Thanks for the tutorial, and happy weekend! I love it - thanks for sharing. This is on my "to do" list with the kids. They would have so much fun with this! SOOO Cute!! 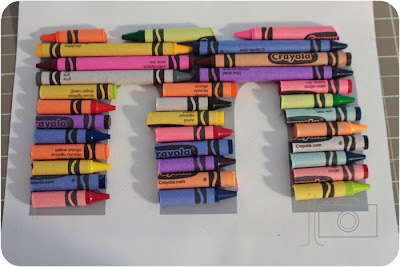 How cute and CREATIVE! Love, love, LOVE! VERY cute. WAY adorable. Thanks for sharing. I'm your latest follower. I hope you'll stop by my blog at http://scfitz1972.blogspot.com and say hello. What a fantastic PROJECT!! It's bright, joyful and happy all wrapped up into ONE!!! What an adorable project! I love it. How cute is that? Great project! I just love this project! Jan emailed me about it and I'm so glad she did. I would love to link to it if you didn't mind. I love this. I was going to do something similar for Teacher Appreciation Week on my site, http://www.thekrackedkat.blogspot.com. I hope you don't mind if I link to this. You did a fantastic job! Love this project! I think it would look great in a child's room or really anyone who enjoys crafts. Thanks so much for sharing. love it + following you now also! I Love this!!! I made one for a gift for a christening. Literally just finished making it and it came out so great. i was unsure when i started, since i had the letter 'G' to work with, but cutting the crayons on an angle still totally worked. Thanks for sharing this!! I used Microsoft Publisher, and had to blow the letter up to a size 750 font. I kept expanding the text box well beyond the borders of the page to get it that large. if you had a projector, that would work too. This is fantastic! 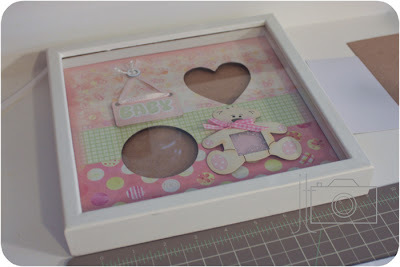 With a new little girl, these types of projects are within my skill level! I will be linking you to my blog soon (in a few weeks). I think these are perfect for baby showers too, just use the colors that the new Mommy chooses. Love it! what a great preschool teacher gift! I just recieved one of these from one of my Pre-K students! Ahhh! It is beautiful. He and his mom did the letter K for my last name(and my fav letter) and they did it in a descending rainbow pattern. 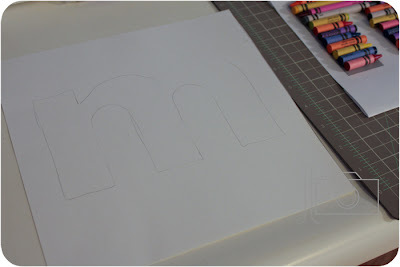 The shadow box is black and the cardstock behind the letter is black...it really pops! 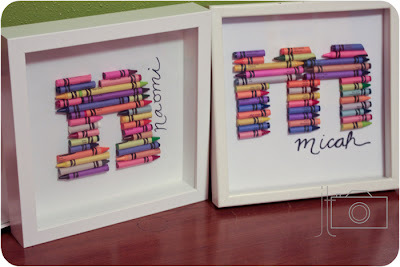 How absolutely marvelous - can't wait to get out my crayon box or maybe even my children's crayons box!! !